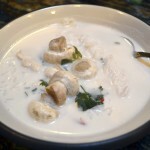 Tom Ka Gai is a coconut-based chicken soup from Thailand. Certainly, it’s hard to duplicate many Thai dishes outside of Thailand for lack of ingredients. Most of them call for things like galangal and kaffir leaves, both of which aren’t the easiest to find. But they can also be substituted with almost no negative effect in some recipes. 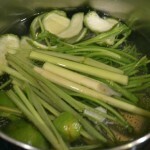 Put the galangal (or ginger), cilantro roots, kaffir leaves (or peel from lime), lemon grass, and 4 cups of water in a saucepan and bring to a boil over medium-high heat. 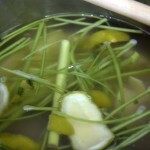 Add fish sauce and lime juice, then lower heat to medium-low and let simmer for 10 to 15 minutes. 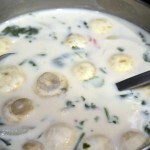 Add coconut milk and bring back to a boil over medium-high heat, stirring frequently. If using, add onion and mushrooms to the mixture and let boil for about 5 minutes. 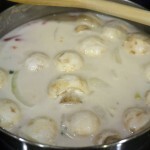 Add the chicken pieces and cook for about two or three minutes or until the chicken is soft and milky looking. Take off heat and serve in bowls with a dash of cilantro leaves on top. You can optionally add cilantro leaves into the soup proper just before taking off heat.